Location/ Directions: I-75 / I-71, Exit # 192 from the north, Exit # 191 from the south, just east, look for circular building. About Hotel: 18-Stories, 236-Rooms, Interior Corridors, Balconies facing downtown Cincinnati or northern Kentucky, 24-hour Corner Pantry, Cable television, High-speed, wireless Internet access in all rooms (complimentary), Room service available 7:30am-10pm, Sleep Number® beds available in most rooms, USA Today newspaper (complimentary), Work desk with extra outlets and ergonomic chair, "360" our award-winning restaurant, "Kelly's Public House" our on-site Irish pub, Complimentary airport shuttle service to and from Cincinnati/Northern Kentucky International Airport (CVG), Complimentary parking, Concierge service at Front Desk, Fitness Center, Indoor pool and whirlpool area with retractable roof, Valet and coin-operated laundry service on site, Air Conditioning, Refrigerator, Iron, Television (Cable/Satellite), Microwave Oven, Non-Smoking Rooms, Coffee Maker, Telephone (Voicemail). Railroad View: Good, trains pass through Covington on an elevated rail line, which puts them above most trees and structures. You can watch then cross the Ohio River Bridge as they go to / from Cincinnati's Queensgate Yard. With a good set of binoculars, you can see the Norfolk Southern bridge crossing the Ohio River, just to the west. That is NS's Rat Hole line, another busy route. I am not sure of the number of trains that CSX runs, but it's a busy line. Notes: This 1972 built hotel was the tops of its time when built complete with futuristic "circular construction". But you don't have to be a fan of the Jetson's (cartoon) to enjoy this hotel. Its well maintained, and updated to today's standards. The view from the hotel is breathtaking, especially at night! A room on the north side will earn you a view of the Ohio River and Cincinnati. The railroad is about 1/4 mile to the east, any ro om on the north, east, or south sides should give you a railroad view. When in the area, don't miss the Cincinnati Union Terminal (multi-museums & Amtrak station) the best feature of the station for railfans is the Cincinnati Railroad Clubs "Tower A" located upstairs in the rear of the station (Free, open Thursdays 8pm to 11pm, SAT & SUN 12noon to 4pm). In Covington, stop by the "Railway Museum of Greater Cincinnati", (fee $4.00) they are open WED + SAT 10am to 4pm year round. They have some locomotives and a large collection of rolling stock, CSX trains do pass the museum grounds. Comments: During my visit, I can add that rooms are small (pie shaped), but the balconies is what's it's all about, (not ideal for people afraid of heights). You don't have to go too high to get a railroad view, just enough to see above trees and local businesses. Photo Comments: Photo is taken from a room on the east side. Zoom lens & video camera work well from here as well. It was a hazy morning when this picture was taken; afternoon sun is perfect for pictures from this hotel. Location/ Directions: From 71-75 North to Covington 5th Street (Exit #192). Turn left onto Philadelphia (1st stop light). Turn right at 2nd light onto 3rd street. Hotel is on the left. About Hotel: 9-Floors, 187-Rooms, Interior Corridors, Complimentary on-site parking, High-Speed Internet, Pets not allowed, Air conditioning, Alarm clock, Coffee maker/tea service, Crib, Individual climate control, Iron and ironing board, Mini fridge in some rooms, Rollaway bed, Hair dryer, Color Cable/satellite TV with HBO, Microwave oven, Two-Line Speakerphone with voice mail, Courtyard Fitness Center, Indoor Pool, Whirlpool. Railroad View: Excellent View! Just about every room in this motel will have a railroad view. Rooms on the rear overlook Cincinnati. Front rooms will have an ideal railroad view. Higher floors will bring you track level since the railroad is elevated through Covington. Best Motel-Railroad View in Covington! Even numbered rooms face the river & Cincinnati. Photo Comment: Top Photo: Exterior of the Courtyard is seen looking north. In this picture you can see a couple cars of a passing CSX coal train to the right side of the hotel. This photo was taken with a zoom lens from a balcony at the Radisson Hotel. Right Photo: A picture taken from US-42, crossing into Kentucky from Cincinnati, the CSX railroad tracks parallel US-42 across the bridge, you can see the Courtyard clearly from the bridge. Location/ Directions: Follow I-275 to I-71/I-75 N. Take exit 192 and merge onto W 5th Steet. Turn Left on to Philadelphia Street. Turn Left onto 3rd Street. Hotel is on the right. About Hotel: 4-Floors, 156-Rooms, Interior Corridors, No Pets Allowed, Color Cable / Satellite TV, Work Desk w/ Lamp, Phone with Voice Mail, High-speed Internet Access, Bathtub, Hairdryer, Private Bathroom, Coffee Maker, Connecting Rooms, Crib, Individually Controlled Air Conditioning, Iron / Ironing Board, Business Center, Health/Fitness Center On-Site, Outdoor Pool, GuestLaundry (washer/dryer), Daily Housekeeping, Ice Machine, Lounge & Restaurant (on-site). Railroad View: Fair View. Of the three Covington hotels listed on this web site, this hotel has the poorest railroad view. Rooms on the rear of the hotel will give you a fair view. You can't see the trains at night from this hotel, daytime view is narrow, not good for photo's. 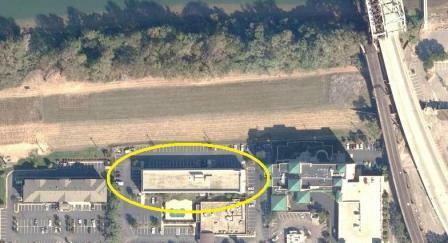 Photo Comment: The satellite photo shows the Holiday Inn circled in yellow. The double track railroad is elevated past the hotel via a suspension bridge. The railroad view from the rooms will be off to the right. At night the area between the hotel and the railroad is very dark, you will not be able to see the passing trains.